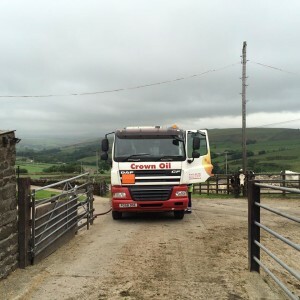 As one of the social media and blogging team here at Crown Oil, I usually spend my day in the office (away from the normal folk) trying to come up with engaging, informative and helpful things to talk about. 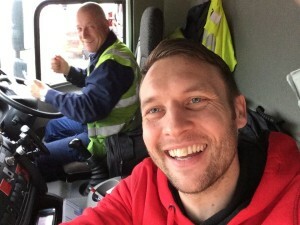 Last week, I was allowed out of the office to stretch my legs and spend my day with one of our fuel delivery drivers. 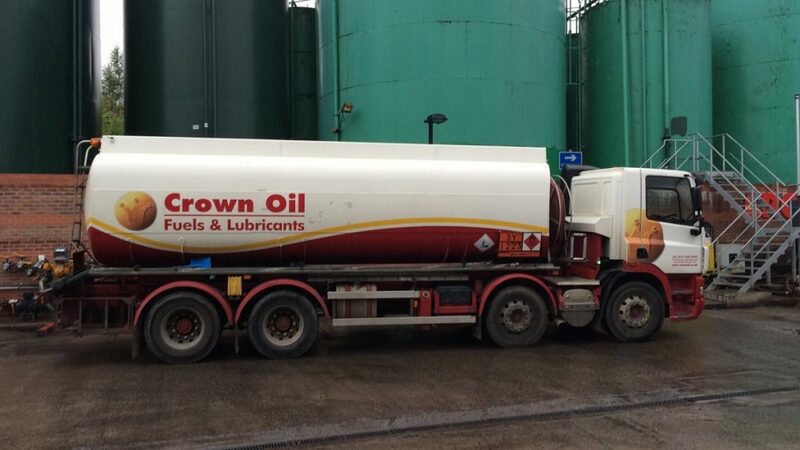 I ended up taking a few photos and asking a lot of questions and thought I’d give you all an idea of a typical day in the life of a fuel tanker driver for Crown Oil! 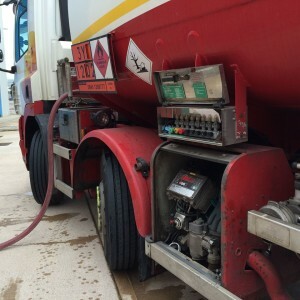 How does the day of a fuel delivery driver start? Early! My alarm clock started to sing at 5 am and I peeled myself from my comfy bed. I ate my porridge, had a shower and got ready; swapping my usual shirt and trousers for jogging pants and a hoodie! When I spoke to Tony (the fuel tanker driver) he told me that he woke up at the same time as me and also had porridge that morning to start the day! For him, this was a daily occurrence but for me, it was a bit earlier than I was used to, although I’m usually up at 5:30 am most mornings anyway. That half an hour makes the difference though! 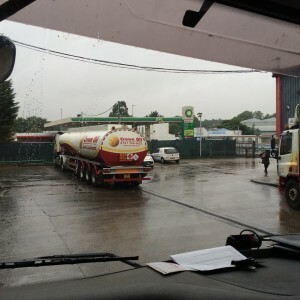 We met at the Oil Centre at 6 am where Tony was faced with a job sheet detailing the fuel deliveries he had for the day. Tony then loaded the tanker with the required red diesel and kerosene for that day’s deliveries. It was raining outside and took him around 30 – 45 minutes. I wanted to get involved and help but ended up just taking pictures from a distance and then going back to the Oil Center where it was dry. After a quick check of the map, we set off to our first fuel delivery (but not before getting a cheeky selfie). I asked him why he didn’t just use satellite navigation but, it doesn’t tend to point out weight restrictions and other road features which are difficult for a large fuel tanker to access. I must admit that I’d be useless as I’m a load of rubbish at map reading. We were on an 8 wheel rigid tanker which is also known as a 4 axle rigid! The one below is a larger oil tanker called an artic (articulated) which can carry a load of 36,000 litres of fuel. For our next deliveries, our route took us around the North of England and the deliveries were spread out. After a few tight squeezes and some amazing views over the countryside, we made it to our first delivery. It was a farm which required both kerosene and tractor diesel. The kerosene was the first to be transferred and would be used for heating the farmhouse. The farm was clean and tidy which gave me the chance to get out of the tanker and take a few pictures. I think the farmers thought I was a bit mad (and they’re probably right). It wasn’t just me who was interested in how the kerosene is delivered from the tanker to the storage tank. If you look closer you’ll see Daisy the cow having a right nosy! Tony took the hose and walked over to the Kero tank and connected the hose. He then went to the controls on the side of the tanker and input the required volume of kerosene to transfer into the storage tank. It took about 15-20 minutes for the 1,000 litres of kerosene fuel to transfer from tanker to tank. Once that was complete Tony disconnected the hose and winched it back onto the tanker. We then drove another 100 meters up the farmyard to the red diesel storage tank and filled it up using the same method. Although most oil storage tanks have an emergency cut off to prevent overfilling and spillages, fuel delivery drivers still have to observe the transfer and check the tank level to ensure there are no mishaps. The next delivery was at an industrial location which needed red diesel for its forklift trucks and other machinery. I was warned about this place because it could sometimes be a bit smelly. I decided not to take many pictures because it was an abattoir and lacked those scenic views which you saw on our first job. This was a larger delivery of gas oil (red diesel) which required a different nozzle on the hose. The fuel tankers carry several different nozzle fittings to connect to various storage tanks. This particular oil tank could have had a wider hose which would have made the fuel delivery faster but the access was too difficult and the wider hose is slightly shorter. This meant that it wouldn’t reach. Fortunately, it wasn’t very smelly at all and being there for a longer period wasn’t too bad. Drivers of large vehicles must have rest stops by law. After our second delivery, we decided to have a well-deserved break and a bite to eat. We found a lay-by and ate our lunch. Throughout the whole day I asked lots of questions and probably annoyed Tony a little bit but he didn’t let it show! Due to the distance between our fuel deliveries, we were only given three fuel deliveries on this day and typically, this last one had a ‘no camera’ sign! Can you believe it! When we arrived at our destination we had to pass a security checkpoint and show our ID. The only directions to get to the oil tank were from another driver who had been there before and had explained where it was. Unfortunately, it was roughly a two-mile drive from the security checkpoint and the directions weren’t exactly straight forward. However, whilst I panicked, Tony kept his eyes open and spotted the tank about 5 minutes later. Access wasn’t possible from our current direction so we turned around at the next available opportunity and pulled up a few meters from the tank to check it was the correct one. Tony hooked up the hose to the tank and started filling it with red diesel. 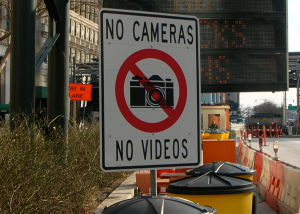 I was just about to start taking some pictures after leaving a few out on the last job only to find a sign glaring at me stating ‘no cameras’. They must have seen me and my bad photography earlier in the day! 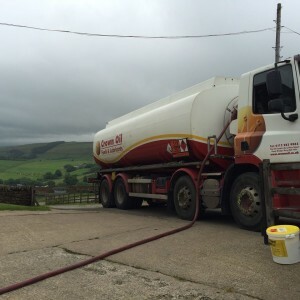 As with all our other deliveries, Tony kept his eye on the fuel level of the storage tank and would check the amount transferred to ensure no spills or overfilling occurred. Once the transfer was complete, Tony printed off a receipt for the amount of red diesel supplied and left it in a small pouch for the company to pick up. We then set off back to the Oil Center after a good day out on the road in the North of England. We arrived back at 3:30 pm. Tony proceeded to clean the tanker and park it up ready to be used for tomorrow’s deliveries.